Four new rikishi appeared on the banzuke for the first time in this new year of 2008. A generation in which it is difficult to see real potential right now: which makes following them in January all the more interesting in an attempt to better analyse their abilities. One wrestler does stand out from this small group however : Ogata. At 23 years old, this Kise beya deshi managed to enter as a new rikishi at the oldest possible age for a shin-deshi. That makes him markedly older, by five to seven years, than the other three recruits and also more experienced. Ogata has previous experience in amateur sumo at university level. Although his past was not particularly spectacular (only a third place in 2005 at the Japanese university championships), it was enough for him to finish the mae-zumo trials undefeated. The other three recruits from this generation have managed to accomplish a perfect equal score. Each of them defeated one of his two adversaries. Therefore, they could be a surprisingly homogeneous generation. One last point they have in common: all three belong to heya that recruited quite actively in 2007. Takamine is a new shin-deshi for Michinoku beya. His arrival confirms that this heya is currently in a recruiting phase. Measuring 139 kg on a 1,80 m frame, he has the most promising build of his generation. With him and Daigen, recruited two months ago, Michinoku oyakata perhaps has a good couple of young rikishi as the foundation of a new generation. Hanaoka was recruited by Tamanoi beya. Although he had not practiced sumo before his recruitment, and moreover knew nothing of the sport, it was Tamanoi oyakata himself who spotted him during the provincial tour last August. It is particularly interesting to note here the influence of the affair of Tokitaizan's death (as reported in previous issues of Le Monde du Sumo and Petit Banzuke Illustré). 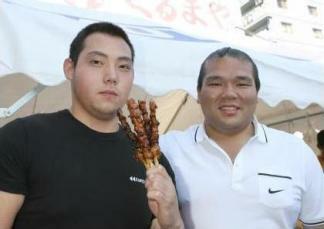 In fact, Tamanoi oyakata indicated that he stressed the proximity of a hospital to his heya to the young man's parents. Oyamasaki is one recruit more (again!) for Shikoroyama beya. He is very young (16 years old, like Takamine), so his body has yet to develop. Therefore it is, at present, difficult to know what he will eventually be capable of. Table listing rank, shikona, real name, date of birth, height and weight, heya and maezumo results of all new recruits.